Gene and Barbara Steinberg were sued in 2012 for failing to repay some $44,000 in personal loans to James M. Torson. The ensuing court motions included a scathing five-page letter penned by Steinberg's late brother-in-law Stephen Beizer, public records obtained from Coconino County Superior Court reveal. Beizer accused Steinberg of exploiting Beizer's personal plight in order to obtain cash donations, the vast amount of which, Beizer claimed, Steinberg kept for himself. The Steinbergs were eventually judged responsible for debt in excess of $44,000 in the case which began with a complaint for breach of contract filed against the couple by Torson. The debt was the result of 14 personal loans issued between 2011 and 2012. 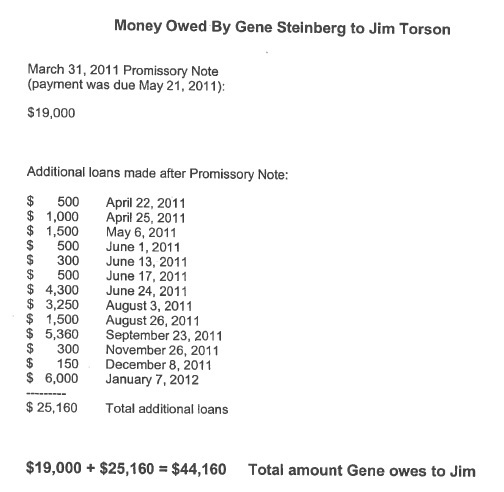 A promissory note for repayment was previously signed by the Steinbergs to Torson, but records indicate a total of just $50 was actually repaid, and not until legal action was imminent. Default judgments against the Steinbergs proceeded, and garnishments were attempted. The debt was eventually discharged in Gene Steinberg's 2016 bankruptcy filing. Court records do not clarify specific reasons given by the Steinbergs to Torson for the purposes of the loans. Attempts to reach Torson for comment were not initially successful. Attorneys acting on behalf of Torson submitted an application for writ of garnishment in 2012 on the now deceased Stephen Beizer, seeking payment from Beizer for the debt incurred by the Steinbergs. Steinberg has long dubiously claimed his publicized money woes were partly attributable to his generosity to Beizer. Steinberg further claimed Beizer was anticipating a lucrative financial settlement which would create a windfall for Steinberg, but no significant evidence of any such settlement has ever been produced. ...I had a surprise visit from someone with intimate knowledge of Gene's skull-duggery and it was admitted to me that Gene not only told wild and untrue stories about me and my family, but he posted a picture of MY SON on the internet for more sympathy and of course more money not for my son, but to fill his, Gene Steinberg's, pockets – from the moment in Sept 2012 going forward to eternity; I do not, my family does not owe, will never pay or give anything to the Defendants in this action. They are in debt to me and my family and it is so clear now that the CRUMBS are what we survived on, but the check for the MEAL is now ALL HIS RESPONSIBILITY TO PAY. We repudiate ANY DEBT to GENE or BARBARA STEINBERG. To whatever extent Beizer's statements may or may not be entirely accurate (see the entire five-page letter submitted by Beizer, pp18-22 of pdf), his conflict with Steinberg makes it ever more clear that Steinberg's ongoing framing of the pair's relationship is less than transparent. Steinberg long used his claim of expecting a substantial sum of money from the Beizers as collateral to justify his hundreds of annual requests for handouts. However, Beizer could not have made it more apparent that no such repayment or gift was forthcoming. Steinberg nonetheless persisted with the story. Moreover and as explored in a previous blog post, Steinberg chronically failed to disclose to his following that Beizer pleaded guilty in 2004 to charges of Sale of Unregistered Securities and Theft. The charges arose out of what the Arizona Attorney General's Office described as bilking two elderly women out of hundreds of thousands of dollars. Steinberg repeatedly spun Beizer as a victim worthy of charity, going as far as to criticize those who sought legal action against him, while never accurately portraying the circumstances. In 2009 Steinberg presented Beizer to Paracast listeners as a “currency trader.” In doing so, Steinberg neglected to disclose Beizer was, in fact, the purported down on his luck brother-in-law described in Steinberg's ongoing cash solicitations. Furthermore, Steinberg neglected to disclose to his Paracast and Tech Night Owl followings that Beizer pleaded guilty to felony theft charges, and neglected to disclose Beizer owed $186,000 in restitution to his theft victims. This was the case all while Steinberg solicited money, supposedly on behalf of Beizer, through emails dispersed to those followings. However one chooses to interpret all of the public court documents, it remains glaringly clear Steinberg frequently misrepresents the situations. Omissions and inaccuracies are commonplace, while public solicitations for cash under the guise of chronic emergencies continues relentlessly from a man, Steinberg, who presents himself as a gold standard of reporting on issues surrounding the paranormal genre. Fraud or other crimes perpetrated through the internet may be reported at the FBI Internet Crime Complaint Center. Other resources include your state's Attorney General, the Department of Justice, and the Federal Trade Commission.